WELLBEING Aloe, a bit of your harmony Feel plenty, enjoy each instant of life and Aloe can help you out to do it. As there are many people satisfied by the marvellous properties of Aloe, today, you can start experiencing the wonders that will help you to reach a life with more quality. Keep an attractive figure, a radiant appearance, recover the enthusiasm and strength are part of the new wellbeing of Aloe that you could reach using products containing certified organic Aloe. BEAUTY Organic beauty with Aloe As you know all looks are looking at you, dazzling the world, showing your best appearance. Aloe gives you another pure, organic and natural beauty coming from the earth, to live fascinated for being a woman. As an involving caress, Aloe Vera provides a freshness sensation to help your skin to recover the softness and protect you from ambient factors. A brilliant face, a dreaming smile, a shining and strong hair, it is always easy to get it with organic Aloe products. HEALTH Aloe takes care of you Magic, mysticism and ancestral knowledge always along the Aloe. Nutricosmetic, a natural panacea against a great quantity of sufferings, without being a medicine, a lot of the natural Aloe Components have benefit effects for the human being. Since topical applications and dermatologic treatment on burns, skin irritations up to it’s applications as cellular reconstitute, analgesic, antibiotic and effective laxative, the Aloe is one of the most appreciated ingredients in the pharmaceutical industry without any medical prescription, since they have extracted from the plant the best properties always thinking in people’s health. 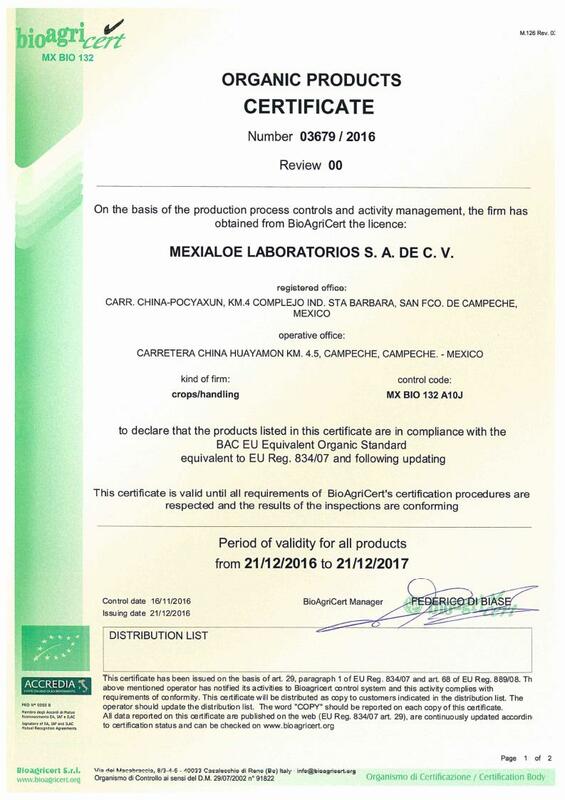 COMPANY Mexialoe Laboratorios, S.A. de C.V. is the leader company in Mexico and America Latina in the production and process of organic certified Aloe Vera raw materials. Founded in 1989 and located in the South-eastern part of Mexico, we supply Aloe Vera raw materials to the most important companies and laboratories in the Cosmetic, Food, Pharmaceutical and Personal Care Industries all over the world. Always at the vanguard in technologic innovations and development of new products, Mexialoe Laboratorios keeps their commitment offering our customers with the maximum purity, all year long supply and the most attractive prices in the market. LOCATION Strategically located in the Yucatan peninsula, close to the most important ports and airports of the country, which give us a competitive advantage with the logistic of our export shipments. 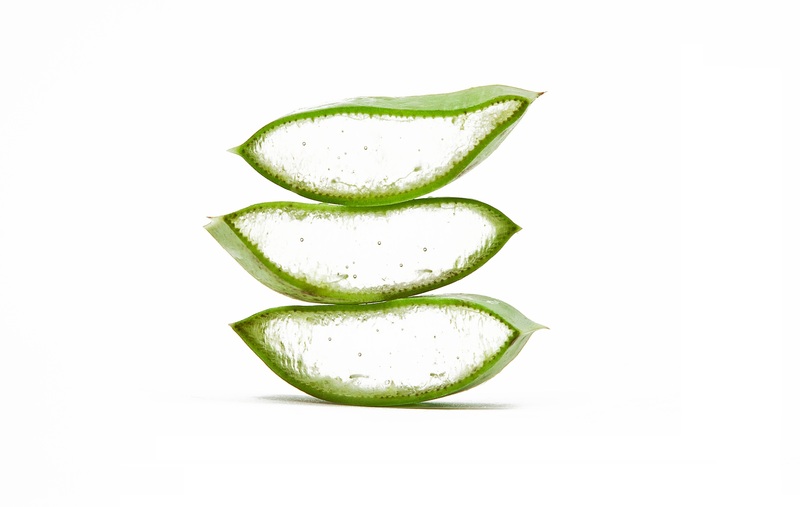 ALOE VERA ORGANIC CERTIFIED PURITY The organic certified purity of our raw materials has opened to us the doors into the most important markets with a great success in Europe, Asia, America, Africa and Oceania where our quality and customer service are an excellent reference to our brand. Every single year, we participate at very important International and specialized trade exhibitions, promoting proudly the quality of our products. PROCESS Through two decades of intensive work, we consolidate an integral agro-industrial process. Beginning from the selection, sowing and cultivations of our plants until the packaging and commercialization of our raw materials. 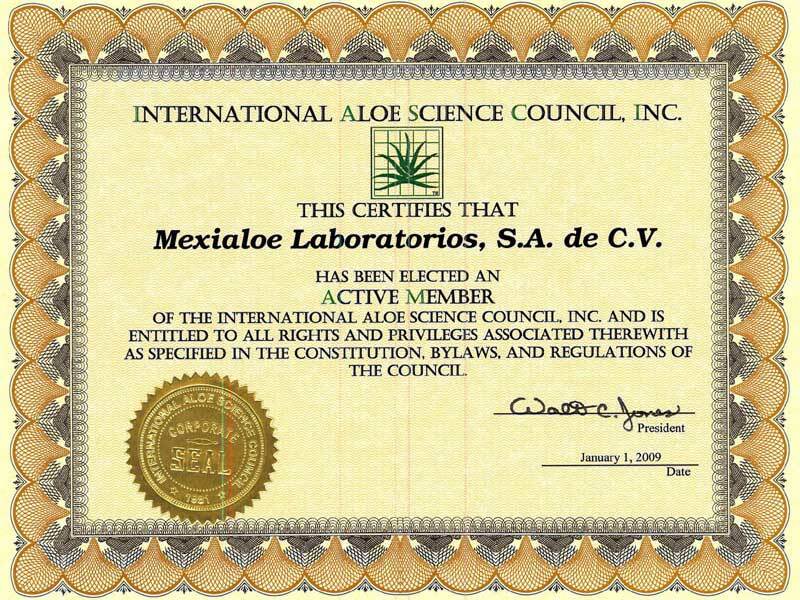 Mexialoe Laboratorios has a strong commitment to care and preserve the nature. Therefore, equipment and technology investments are being constantly made to keep the efficiency Qualified high trained personnel and state of art technology are the reason to produce high quality products with an extraordinary stability and purity which provide quality and aggregate value to our customer’s formulations. ORGANIC ALOE Our Aloe Vera plantations are organically grown, without using any chemical products or fertilizers. Our plantations count with the ideal temperature and humidity. Our proper manual plant harvest and technology allow us to get a 100% organic Aloe Vera to supply the industry standards. CERTIFICATIONS Our fields are certified organic, completely free of chemicals according to the EC standards and NOP (USDA) Regulations. 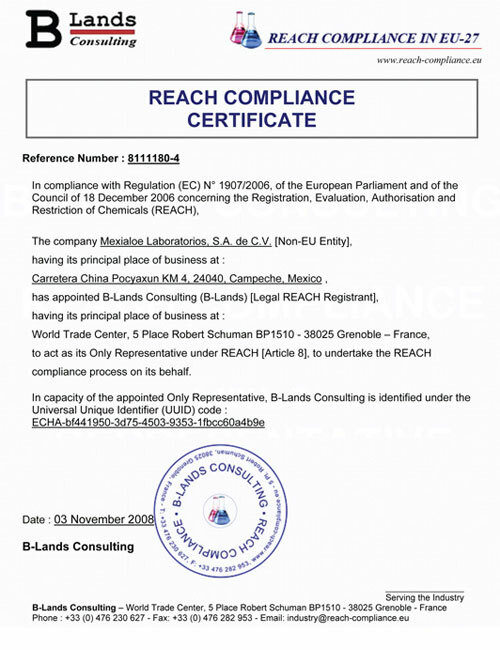 Our raw material quality is guarantee by the most prestigious worldwide known Certifiers companies. 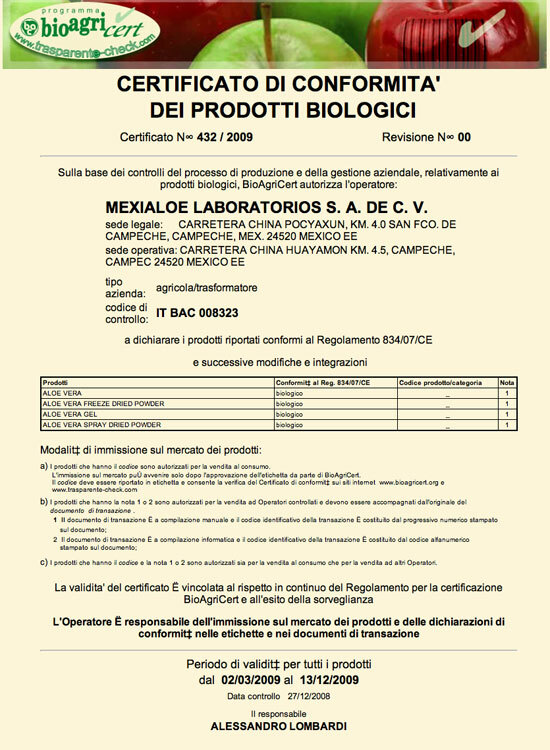 Organic Certificated Quality according to the CEE 2092/91 by Bioagricert S.R.L. 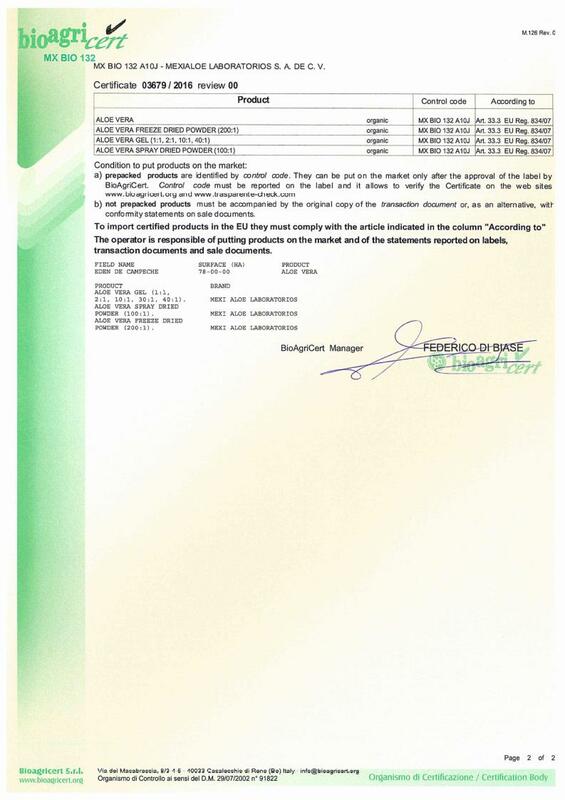 Organic Certificated Quality according to the NOP USDA by Bioagricert S.R.L. 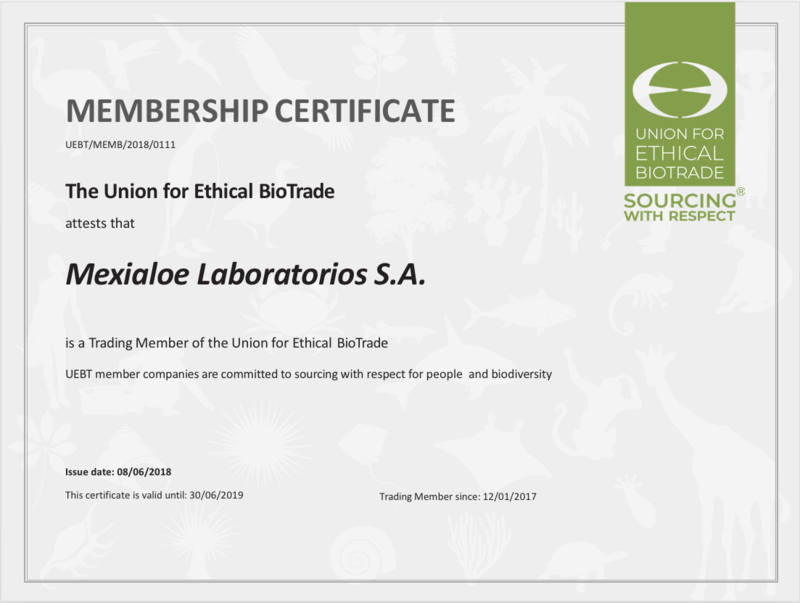 Organic Certificated Quality according to JAS by Bioagricert S.R.L. QUALITY At Mexialoe Quality Lab, we perform strict controls to fulfill with the most demanding requirements of the Cosmetic, Food and Pharmaceutical Industries. We also fulfill with the standards from the USA Good Manufacturing Practices, FDA and HACCP. Our state of the art technology, allows us to test the purity and components of our products through a Nuclear Magnetic Resonance Test (NMR). BUSINESS Your entrepreneur vision can take you to initiate a successful business, taking into considerations the advantages of the Aloe Vera greatest benefits. Take care of the most demanding needs of the market looking for organic certified products.